Do you prefer American terms? Click through to the US edition of this tutorial. Confused that there is even a difference? Check out the terminology Cheat Sheet. Hooray! You made a chain! Get you! *high five and belly bumps*. I am not kidding when I say the hardest part is over. Getting the hook and yarn co-ordinated is really tricky. From here, the only way is forward. While you could festoon your house with chain stitches, they generally are just the base of a project. Your next step is working stitches into them. Start by inserting your hook into the second chain from the hook . That first chain is skipped because you need some space to turn your hook and raise the row the correct height. This is usually called the turning or beginning chain. 2. Place your yarn over the hook. 3. 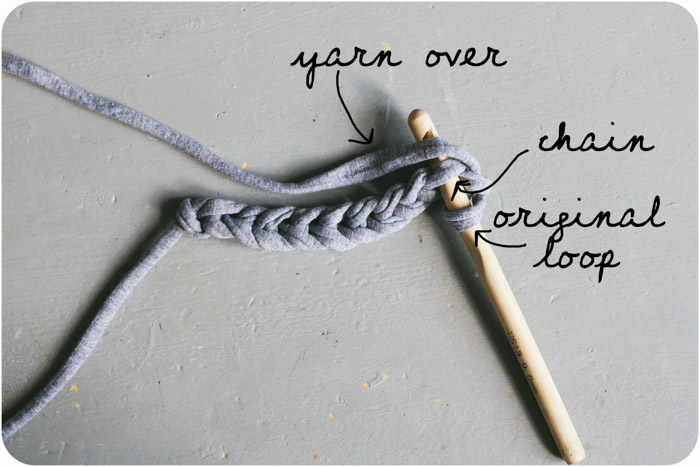 Using the same technique as making your chain, catch your yarn over in your hook, twist your hook downward to pull the yarn over through the first loop on your hook. 5. Pull the yarn over through both loops on your hook. One double crochet stitch made. Work across your chain. You will work into the next unworked chain until you have no chain stitches left to work. Turn your work. For those who are right handed, you will always work from right to left. For those who are left handed, you will always work from left to right. 1. Make 1 chain. This is your turning chain. 2. Insert your hook into the first stitch (not the turning chain). 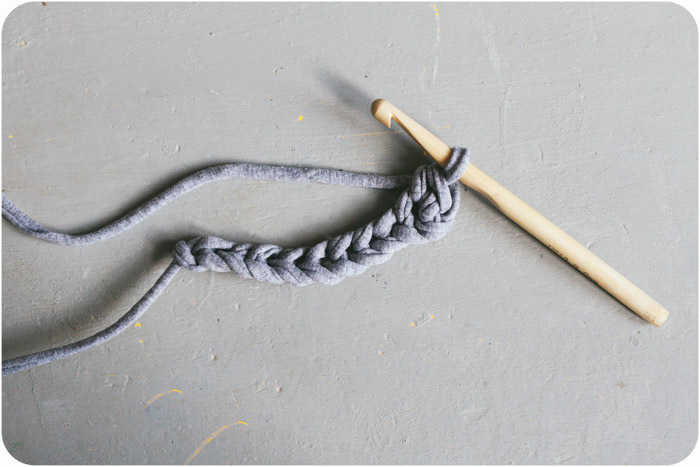 You will insert your hook under the 2 loops of the "V" at the top of your work unless your pattern says otherwise. You are going to work your double crochet stitches in the same way as before. 1. Yarn over your hook. 2. Pull through the stitch. 3. 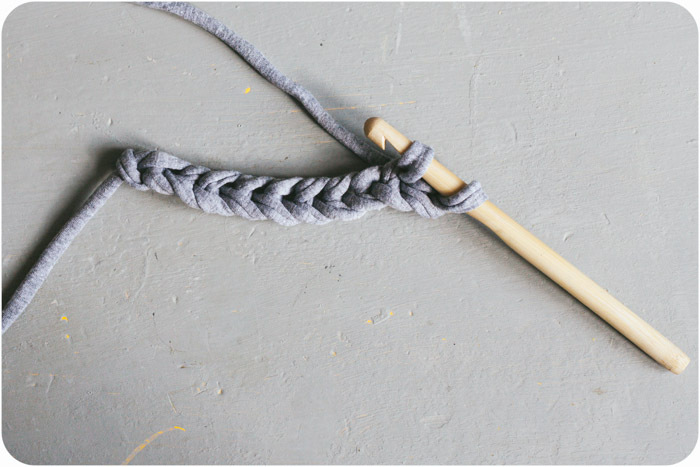 Yarn over your hook. 4. Pull through both loops on your hook. Work until all of the stitches in your row are worked. As a beginner, it is a good idea to count your stitches in each row as you work across. This helps you spot miss stitches early on. Count the "V"s at the top of the row. Continue working rows as above. You can keep track of how many rows you work as you work them by counting in your head, using pen and paper, or using a stitch counters. You can also count the rows in your finished piece. This is unfortunately tricky for double crochet. It can be hard to see the ends of the rows and the stitch creates a very dense fabric. However, you can see where the stitches are worked into the previous rows and count there. Alternatively, you can use the horizontal bars to count your rows. These are created on every row on the back side of the stitch. As you look at your piece of work laid out, you will have 1 horizontal bar on every other row on each side. (Note: there isn't usually a right or wrong side when working crochet in rows, unless specified or using more advanced stitches). Use these to "see" the rows of single crochet and count accordingly. Perhaps the most common problem when working in rows with double crochet is the piece developing a triangular shape. If your rows are getting shorter: this is usually caused by missing a stitch at one or both ends. Make sure you are making your turning chain and then working into the first stitch, as noted above. Also, your last stitch of the row often looks like it is hanging off the side a bit. Ensure you work into it as well. If your rows are getting longer: make sure you are not working into the turning chain at the start of your row and you are only working 1 stitch into each stitch. Kathy Rudd gave a great tip in the Facebook Group on this problem, she said "Put a stitch marker in your first stitch of the row so when you are working back, you know that stitch is the last one. I usually have a marker on each end of a piece and just keep moving it up as I work. Keeps me nice and straight!" When you have worked all of the rows you need and the pattern indicates you should "break yarn" - simply cut your working end of yarn, about 6 inches away from your work and use your hook to pull on the last loop to bring the newly cut end through your stitch. This secures the work temporarily until you can work the next section of directions or weave in your ends. Tomorrow, we have an incredible interview from a very talented designer and we will be looking at working in rounds.